My husband and I are brand new homesteaders, having just moved to our acreage last fall. One of the first things that we did, even before finishing our home, was to start up our garden. Gardening, for us, is a year round chore. What started out last fall as eight raised beds has expanded to include eleven long, wide berms in which we grow food for ourselves, a small local grocery store, and the local Farmer’s Market. We live in Oklahoma — where we battle heavy wind, extreme and sudden changes in weather, and pests galore. For two gardeners who feel strongly about allowing nature to do her own thing in her own way, most insecticides, even organic ones, are not really a good option. But companion planting is, and we work very hard to use this strategy in our garden plan. Companion planting is the very simple, yet age old, technique of grouping together plants that benefit one another, in a setting that echoes what we see in our natural surroundings. Nature doesn’t plant in rows, but rather groups different species together all in the same place. Conventionally cultivated crops where one crop is sown along one row tend to be a magnet for pests and disease. By bringing nature’s pattern into our gardens, we can create a system that is much healthier for us and our surroundings. It repels unwanted insects. Many companion plants such as onions and aromatic herbs give off a scent that repels unfriendly insects from laying eggs or feeding on the crops. Offended by the smell, they will go elsewhere. In other cases, the companion plant will mask the smell of the crop confusing unwanted guests. It can attract beneficial insects such as bees. Every gardener needs bees! Bee magnets such as coriander (cilantro) in bloom, hyssop, lemon balm, and monarda (also called bee balm), just to name a few, can be planted in and around your garden to invite these garden friends. But bees aren’t the only beneficials we like to see in the garden. Dill, for example, can attract spiders, lacewings, and parasitic wasps that will prey upon unwanted pests. It can provide protection for more delicate plants. In some situations, taller plants can protect more delicate ones by providing shade or a windbreak. Sunflowers planted with leafy crops such as lettuce and kale will provide some shade in an exposed area. Sturdy okra planted to the windward side of peppers will help provide a buffer from the wind. Certain plants can actually help improve the flavor of others. Summer savory, when planted with pole beans, will help improve their flavor. Chives will help along the flavor of carrots, and chervil will help produce tasty radishes. 1. Choose your plants. If you know your vegetable families, this info will come in handy as the same families do well with the same companions. 2. Set the plants in your garden beds. Allow the plant buddies to mingle freely, aiming for a free form natural effect as opposed to rows. If you prefer rows (and I have to admit that I still do) alternate your plants or alternate your rows. While some plants do well together, others can work against each other. Peas and garlic reportedly work against each other reducing yields in the garden bed. Basil and rue are not friendly toward one another either. Some things take time. Growing marigolds is an excellent way of controlling nematodes, but they will need a full season, perhaps more, to do their thing. And while we’re on the subject of marigolds, these beautiful, easy to grow annuals are a favorite companion plant for many crops: especially tomatoes. Do keep in mind however, that while they control nematodes, they can attract spider mites which can be very difficult to control. Mint can be invasive! Mint is another favorite companion of many because it is so aromatic. Be careful planting it directly in your garden bed, though, as it will very quickly take over. It is better to use mint in a pot. If you want the look of having the mint growing in the ground with everything else, bury the pot in the garden bed. Don’t be afraid to break a few rules. Every garden is different; every climate is different. Be willing to experiment and try what works for you in your situation. As mentioned, peas reportedly do not like onions and garlic, but I (ahem) forgot last fall when I planted both, and set them in the same bed. Both are doing fine. Sometimes it is hard to think outside the box. Even as a gardener who strives for a natural garden setting, as I mentioned above, I still gravitate toward rows. I like things to look neat and tidy. So far, I’ve had success with alternating rows of friendly plants. Companion plants don’t always grow at the same rate. I planted some dill seeds alongside my very young cabbages this spring. The cabbages have now matured, but the dill has just started to sprout. Next time I plan to give the dill a head start indoors and set it out as a seedling along with the cabbages. Some companion plants such as herbs are perennials, whereas many of my vegetables are not. This makes crop rotation (if you wish to practice it) a bit of a challenge. I’m still experimenting in this area. I'm considering annual herbs to rotate along with annual vegetable crops, but also investigating some perennial vegetables that can stay put with their perennial buddies. 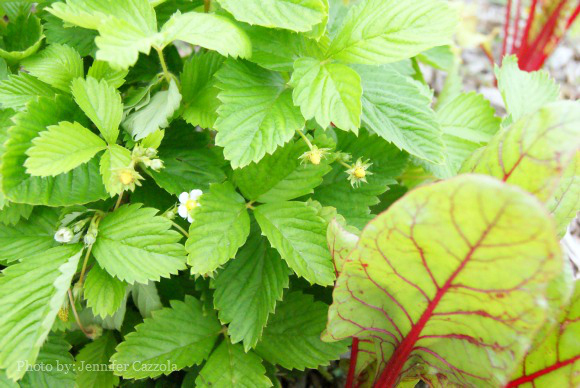 Companion plants repel insects, but don’t always eliminate them entirely. I still get some damage. In the case of my basil growing with my tomatoes, something has ignored the tomatoes while devouring the basil. I have lovely tomato plants, but my basil is looking pretty ragged. Next year, we’ll plant extra to compensate for loss. While there is some scientific evidence as to what works best with what and why, much of this is information that has been handed down through the generations from gardener to gardener as opposed to hard and fast, proven scientific rules. View these as recommendations and feel free to experiment in your own garden. Beans love: carrots, cauliflower, cucumbers, marigolds, and cabbages. Summer savory will help improve the flavor both when planted and cooked with beans. Avoid: garlic, shallots, chives. Beets love: cabbage, onions. If your family enjoys kohlrabi, alternate with beets in the garden bed. They enjoy similar requirements and work well next to each other as the beet grows underground while the kohlrabi grows on top. Avoid: pole beans. Cabbages love: celery, dill, sage, peppermint, rosemary, onions, and potatoes. Avoid: strawberries, tomatoes, and pole beans. Carrots love: onions, leeks, rosemary, sage, lettuce, and tomatoes. Radishes planted with carrots will break through a crusty soil, paving the way for the seedlings to emerge. Avoid: dill and anise. Cucumbers love: beans, peas, radishes, and sunflowers. Avoid: potatoes, aromatic herbs. Lettuce loves: strawberries, cucumbers, carrots, radishes, and onions. Avoid: Lettuce is popular in the garden bed. She has no known plant enemies. Peas love: carrots, turnips, radishes, cucumbers, beans, potatoes, and aromatic herbs. Avoid: onions and garlic. Potatoes love: beans, cabbage, corn, horseradish. Avoid: pumpkins, tomatoes, squash, cucumbers, and sunflowers. Tomatoes love: chives, onion, parsley, marigolds, basil and carrots. Borage is reported to repel the tomato hornworm. Avoid: potatoes and cabbage. Squash loves: corn, beans, sunflowers. Radishes planted with the squash will help prevent squash bugs, as will nasturtiums. Avoid: potatoes. For more information on this subject I highly recommend reading Carrots Love Tomatoes: Secrets of Companion Planting for Successful Gardening by Louise Riotte. 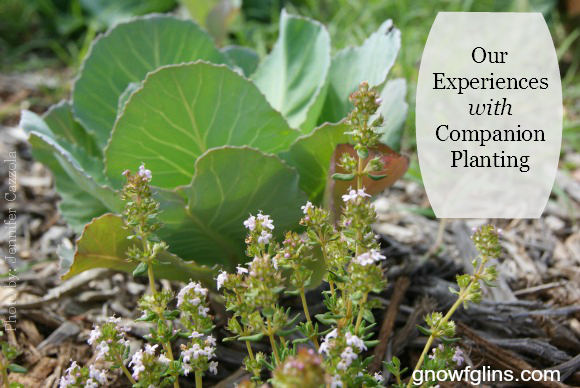 Do you practice companion planting in your garden? What combinations have you found to be most helpful? I use marigolds around tomatoes and zucchini. The added benefit of the marigolds is that my chickens love to eat the deadheads that I pluck. Wonderful, useful information. Thank you so much for sharing. I’m not the best at planning my gardens with companions in mind. I hope to get better in the future and this post will help me do just that! I had heard that Hyssop was good to repel white cabbage moth and so I planted it in my brassicas bed. It’s our first year gardening too and our few broccoli that transplanted were absolutely pillaged by white cabbage moths. All of the plants decimated. However, the 2 plants closest to the hyssop did have substantially less caterpillars and when the hyssop threw out its one flower those 2 bushes were caterpillar free. I am anxious to use hyssop myself. It grows really well in our climate which can be difficult. It is another one of those perennial plants though and I do like to rotate my crops so I’m not quite sure how to handle it. We have actively tried to companion plant in our garden the last couple of years and have struggled with the same question – what to do about perennial companions (and re-seeding annuals) when you rotate your crops? So far I have tried to keep to annual companions as much as possible for this reason. We used to have a horrible problem with beetles on our squash an cucumbers until I started planting them with nasturtium, which just might be my favourite companion plant. I also like borage with tomatoes, and although horseradish might be good for keeping potato beetles at bay, it should never be planted directly into your garden as it spreads quickly and is impossible to get rid of (I learned that the hard way…) Thanks for a great article! I *have* heard other gardeners planting crops in the same spot year after year until they have problems. In fact, in the book I’ve referenced, the author claims to have planted her tomatoes in the same spot year after year. I’m not really sure how I feel about that. Where I live, we have so many pests, that that is pretty much asking for trouble. It would however eliminate the problem of the perennial herbs that make such nice companions if a gardener was willing to take the risk. I envy your nasturtiums. 🙂 I have a few, but they aren’t really taking off like I had hoped and am still experimenting to find the best variety that works in our tricky climate. My mother-in-law was amazed at my nasturtiums too, but I grow a dwarf variety and they seem to do well despite our short and unpredictable growing season. Good luck with it Janet! Thank you Lindsey. It takes a few seasons to figure things out. Thanks for the info! I’ve been wanting to do this but always feel overwhelmed and confused. LOL This should help!! Thank you, thank you, thank you, THANK YOU for this! I’m moving from a tiny upper level apartment to a place with garden space soon and I am so excited at the prospect of growing my own food! Right now I have herbs growing on my teensy porch, and this is the first year I’ve had success with them! It’s really inspiring me to try more when I move!